With its iPhones and iPads, Apple has led people toward a new way of operating digital devices that relies on direct manipulation of items with finger gestures, not a mouse and scroll bars. App icons are arrayed front and center, not buried deep in a file system or limited to a strip at the bottom of the screen. Now, Apple is bringing those concepts and others to the personal computer via its most radical new Macintosh operating system version in years. It’s called Lion and it goes on sale Wednesday for $29.99—a price that allows installation on as many personal Macs as you own. Lion is a giant step in the merger of the personal computer and post-PC devices like tablets and smartphones. It demotes the venerable scroll bar at the side of windows and documents, relying primarily on direct manipulation of documents and lists. It eliminates the need to save your work, automatically saving every version of every document. It resumes programs right where you left off. It can display programs, or an array of all your app icons, in multiple full screens you simply swipe through. And it elevates the role of multitouch gestures and adds new ones. The new system doesn’t turn a Mac into a tablet. It retains traditional computer features not present on smaller devices—like the usual file system, multiple windows, the mouse and physical keyboard. It still runs traditional Mac programs, still can handle Adobe Flash, and doesn’t run iPhone or iPad apps. It doesn’t use a touch screen, instead continuing to rely on the touch pad to perform finger gestures. But it’s a big change. Lion also is a harbinger of things to come. Apple’s historic rival, Microsoft, is working on its own radical overhaul of the dominant Windows PC operating system, due next year, which is also aimed at putting multitouch and other concepts borrowed from smartphones and tablets front and center. I’ve been testing Lion on four Macs, and I like it. I believe its many new features—250 in all—make computing easier and more reliable. I found upgrading easy, and compatibility with existing apps to be very good. Only one app I use frequently proved incompatible, and its maker says a new revision solves that problem. I only suffered one crash in Lion. It occurred on one of many occasions I used iTunes, but Apple says a forthcoming version of iTunes made for Lion should eliminate that. Pressing a special key on a new Mac, or an icon on an old one, brings up a full screen, iPad-like display of app icons. To take full advantage of new features such as full-screen mode (which hides menus), auto-saving and auto-resuming, programs will have to be rewritten. But, in my tests, current versions ran fine. I am writing this column on a MacBook Air running Lion using an unrevised version of Microsoft Word for the Mac, with no problems. There are, however, downsides to anything this new and major. In my view, the biggest of these is that switching to Lion will require a major adjustment even for veteran Mac users, though it will be easier for those who use iPhones or iPads. Lion will significantly increase the learning curve for Windows users switching to the Mac. If you dislike some of these changes, Apple provides settings to return to traditional scrolling, the classic Mail layout, and to turn off gestures and other things. Another big change is in the way Lion is being distributed. It won’t be sold on a disk, initially only via download from the Mac App Store. Since it’s a 4 gigabyte download, that could be a problem for people with slow Internet connections. Apple says its stores will help such users with the download, and that it will sell Lion on a USB thumb drive for $69 in August. In my tests, the download alone took under half an hour on a very fast connection, and about an hour and a half on a more typical one. Once I downloaded the product, the rest of the installation took about an hour. Also, you can only upgrade to Lion directly from the prior OS version, Snow Leopard. So, if you’re running an earlier version, you’ll first have to pay to upgrade to Snow Leopard. Each auto-save creates a “version” of a document and all the versions can be viewed in a visual stack. In addition, Macs with the older PowerPC processors can’t run Lion, and even some of the earliest Macs with Intel processors are shut out. These are mainly machines released in 2006. Older programs originally designed for PowerPC, which still ran on Snow Leopard, will no longer work in Lion. The best known of these is Intuit’s Quicken 2007. Even if you buy a new Mac with Lion pre-installed and your older Mac has Snow Leopard, you’ll have to download a new version of Apple’s migration program for Snow Leopard in order to move over all your programs, settings and files. The company made this new migration utility available on Tuesday. When I tried to migrate my stuff from a Snow Leopard machine to Lion using the current migration program—normally a strength for Apple—the process failed. Apple sent me the new version and it worked. Lion also introduces a new migration feature that will move data and settings—but not programs—from a Windows PC to a Mac, though it requires a free Windows migration utility that Apple couldn’t provide in time for this review. Speaking of Macs with Lion pre-installed, Apple also is upgrading its thin and fast MacBook Air laptops so they use faster chips from Intel. It’s killing off the bottom model of its laptop line, the plain MacBook. But the new MacBook Airs, available Thursday, have the same design, prices and base storage capacity as their predecessors, so this review is focused on Lion. 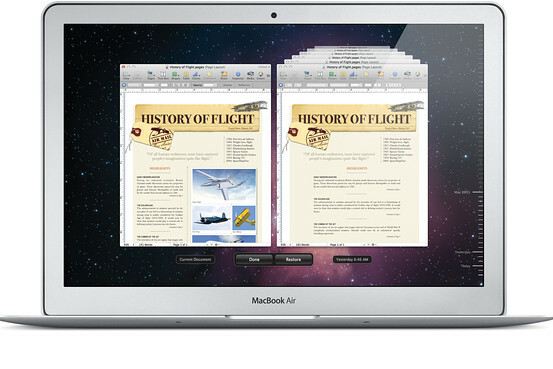 • Auto-Save and Versions: Apps running in Lion automatically save your work when you pause or every five minutes. There is no interruption during this process and you can still save manually. This isn’t a new idea, but it’s implemented beautifully and can work on all programs whose authors issue new versions to take advantage of it. Right now, it works on some of Apple’s own programs. The best part of this is that each auto-save creates a “version” of your document and you can view all these versions in a visual stack arranged by date, next to your current version. You can swap back to an older version, or even copy and paste text from one version to another. These versions are created by storing the changes behind the scenes, not by creating numerous files. To prevent auto-saving, you can lock a document and, for privacy, when you share or transfer a document, only the latest version is copied or sent. • Resume: If you relaunch a program, any document you were working on appears again with the cursor right where it was, and even any highlighting is preserved. If you restart the Mac, all your programs are resumed in this manner, unless you check a box to prevent this. • Full-screen apps: You can launch some apps, or individual browser tabs, in a full screen, by just clicking on an icon at the top right. In full screen, the menu bar and other controls are hidden unless you move the cursor to the top of the screen. • Launchpad: Pressing a special key on a new Mac, or an icon on an old one, brings up an iPad-like display of all your app icons in full screen. If they occupy more than one screen, you just swipe through them. • Mission Control: One of the nicer features on the Mac was called Exposé, which, with one click, showed all your open windows in miniature. Now, it’s been subsumed into something called Mission Control, which does the same thing, but also displays any fullscreen apps or extra desktops. I found it cluttered and wished the simpler, prior feature had been retained. • Gestures: The Mac already had a variety of iPhone-like gestures you could perform on the touch pad. But Lion has changed some of these and added more. One I liked: You can double-tap with two figures to resize a section of a Web page or PDF to zoom in to fill the screen, just like on the iPhone or iPad. Two I dislike: the gestures for calling up Launchpad and Mission Control require pinching or zooming with three fingers and a thumb—a clumsy method for such important features. • Mail: Apple’s Mail app has been totally overhauled to look and work more like the Mail app on the iPad. One particularly nice feature is that it sports a beautiful optional conversation mode, which combines and numbers each message in a thread. It also hides duplicate emails. There are too many changes to detail here, but, after hating the new Mail at first, I have come to like it. And you can switch to Classic mode if you wish. The past two major computer operating system releases, Windows 7 and Snow Leopard, were incremental. Lion is very different. 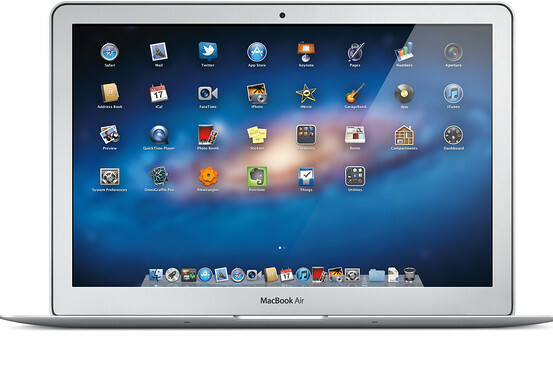 It’s a big leap, and gives the Mac a much more modern look and feel for a world of tablets and smartphones. If you are willing to adjust, it’s the best computer operating system out there.